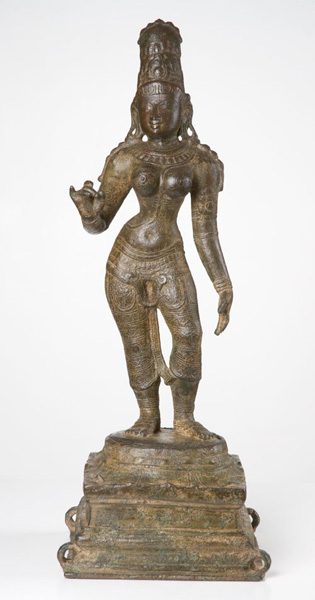 In the first half of the Chola period bronze casters created some of the greatest masterpieces of Indian art. The grace and beauty of this icon, whose pose recalls the movements of the dance, is a part of that tradition. Unlike Indian stone sculpture which was often part of an architectural setting, bronze images like the one shown here are complete in themselves. Carried in procession, they were covered with clothing, jewels, and flower garlands, which hid the sensuous form that is the embodiment of the South Indian ideal of beauty. This posture, the crown of matted locks (jatamukuta), and the sacred cord that passes between her breasts are attributes of Parvati (Daughter of the Mountain). She is consort to Shiva, one of the three primary Hindu gods, and she functions as his sakti (female energy), embodying the active principle and strength of the deity. Parvati also represents the benevolent aspect of the Great Mother, the ancient Indian fertility goddess.